The Temple of Artemis at Ephesus was one of the seven wonders of the ancient world and was built around 550 BC, it was about four times the size of the Parthenon. 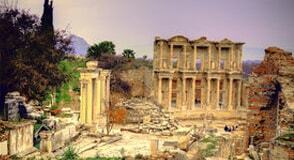 Ephesus was part of the kingdom of Pergamum which Attalus III bequeathed to Rome in 133 BC. Ephesus was the most important Roman city of proconsular Asia. Situated at the mouth of the Cayster River on a gulf of the Aegean sea, it flourished as an important commercial and export centre for Asia. By NT times it had grown to at least 250,000 people (Mounce). Gradually the harbour silted up and is now some miles from the sea. In modern day Turkey Ephesus is known as Efes. 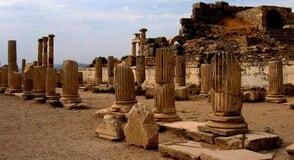 You will be meet by your guide at the Port of Kusadasi where you will begin your Private Ephesus Tours From Kusadasi. First we will visit the Temple of Artemis, one of the seven wonders of the ancient world where your guide will explain to you the significance of this important site. Following this we will make our way to Ephesus which was one of the most important cultural centers of the ancient word. We will visit the Ephesus ruins, Odeon, Celcus Library and the Theatre which is still in use today for concerts and has an amazing capacity of 25,000. As we walk through this ancient site you will notice the streets paved with marble which gives a hint to this city’s great wealth many years ago. Once the tour has finished you will be returned to the Port of Kusadasi. 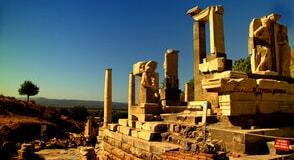 PS: Ephesus Terrace Houses are located on the slopes of Bulbul Mountain, opposite the Hadrian Temple. as only rich people could afford such houses. Terrace Houses is optional with usd 10 extra per person. Minimum required time is 30 minutes.